Nostalgia is something I rarely indulge in, because I consider it to be dangerous in its apparent innocence. We tend to look back at the past with a rosier glow; see it through cheesecloth and Vaseline smeared on the lens to take away the wrinkles and ugliness, make it seem prettier than it actually was. My childhood actually ended when I was thirty-three and decided to live my life rather than continue to allow it to just happen; the events of my life prior to that influenced me and helped make me into the person I am today, so I cannot have any regrets or ‘what-ifs’; I love my life now and I like who I am. I try to live in the present and look ahead; plans and goals are helpful to keep one focused, but they also leave one at the mercy of whimsical fate. You never know, for example, when a hurricane is going to come to your city or a wildfire burn down your home and your plans turn out to be for naught; we are all at the mercy of nature and fate. Nostalgia perhaps explains my love for the Star Wars films; the first film opened when I was a senior in high school, and I have been a fan ever since. I waited in line for three hours to see the very first showing of Return of the Jedi when it opened; the prequel trilogy was a sore disappointment to me. Yet The Force Awakens and Rogue One tapped into that magic I remembered as a teenager, looking up at the big screen and seeing an epic tale of magic and mystery, the battle between good and evil, between freedom and authoritarianism, play out with space ships and droids and light sabers, with heroes and villains that were easily identifiable, and American cinema, for good or bad, was changed forever. Yesterday Paul and I went to see The Last Jedi. It is grim and dreary and windy outside this morning; gray and kind of nasty–the kind of day where you are grateful to stay inside and not ever leave (as of right now, my plan for the day is to stay inside and only go outside to take out the trash if I have to). I got all of my Christmas shopping done Friday and mailed the gifts that needed to go yesterday after I saw (drum roll please) Rogue One. Although after running my errands, I felt much worse than I did when I woke up. I tried to write but couldn’t, and finally abandoned the effort, retiring to my easy chair and my book. I finished reading it, then watched the last few episodes of Medici: Masters of Florence, another couple of episodes of The Man in the High Castle (season two started out kind of slowly but has definitely picked up steam), and another show I’ve been watching on-line: Yuri On Ice. Yuri On Ice is a Japanese anime television series about Yuri Katsuki, a Japanese male figure skater. The show opens with him finishing last at the Grand Prix final, and questioning whether he should just retire. He is considered to be Japan’s best male skater, but he also is shy and introverted, with very little self-confidence, and also suffers from crushing self-doubt and anxiety, which is why he performs poorly. After graduating from college in Detroit, he returns home to his small home town in Japan, and while visiting the ice rink, is recorded perfectly mimicking a routine by five time world champion Viktor Nikiforov. 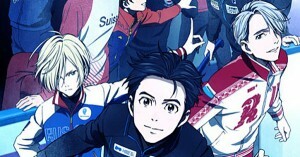 The video goes viral, and Viktor, also questioning his own future in the sport, comes to Japan to be Yuri’s coach–Yuri has always idolized Viktor, and decides to give the sport one more year. I’m really enjoying the show, quite frankly. I’ve never watched Anime before, so I don’t know if the weird lapses into over-the-top emotion from the characters is normal for Anime, but it’s the only thing that bothers me about the show. The character of Yuri is so incredibly well developed; and the skating sequences are absolutely amazing. As a long time figure skating fan, it’s only natural that I would enjoy the show, I suppose. I’ve long been wanting to write a noir about figure skating, and watching this show has really intensified that desire–plus, I’m writing something else, which always makes me want to write other things. I started reading Exit, Pursued by A Bear by E. K. Johnston last night, and am enjoying it thus far. All right, I need to make up for lost time today, so it’s off to the spice mines I go. Paul left early this morning–4:45 am to be exact–and somehow I then managed to sleep in until ten. I have another late night of bar testing this evening, and had planned to get up early and head out to the mall to do my Christmas shopping for Paul as well as stop by the Apple store. Alas, I overslept, and while I could go ahead and get ready quickly and head on out to do it all, I’m also thinking I can just do it tomorrow. Yes, the weekend before Christmas is going to be hideous out there in retail land, but I also don’t want to be rushed. I took tomorrow off because I have some appointments in the late afternoon, but if I can get up by nine tomorrow morning, I can do it all: Target, Apple, Macys, and even Costco. 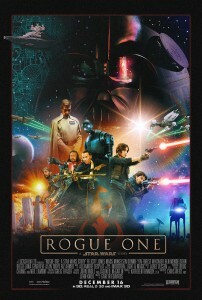 I have tickets for an early (10:00 am) showing of Rogue One Saturday morning at the Prytania Theater, and I intend to get quite a bit of writing–and cleaning–done this weekend. In other exciting news, my editor got back to me and was enormously pleased with the tweaks I made based on her suggestions for my story; I cannot make an official announcement yet but I am very excited. The name of my story is “Lightning Bugs in a Jar,” and I can’t wait to talk about it. Woo-hoo! There’s nothing quite so satisfying as getting praise for your work, is there? Particularly when you’re an author. I always thought that the more work I published, the further along in my career I got, the easier it would get and the less self-doubt there would be. Alas, that isn’t true; if anything, it gets worse. Heavy heaving sigh. So, as soon as I finish this I am going to get cleaning and organizing around here so I won’t have to take time from my weekend to do it. I really want to get this book done. I’m itching to get going on some other projects (as always). All right, sorry for the brevity, but I need to get back to the spice mines. But here’s a hunk for you in the meantime.